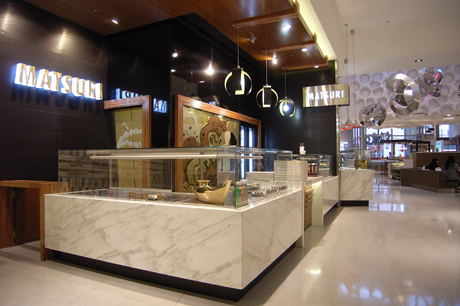 This Japanese food offer in the Enex Food Court is a modern interpretation of the traditional small Japanese food bar. 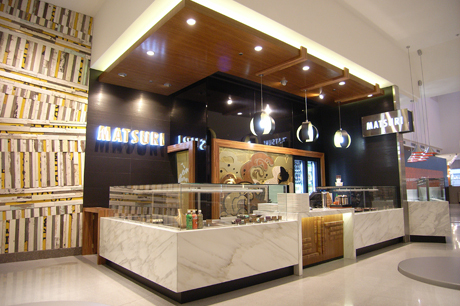 The limited range of elegant finishes in the fitout - white marble, black lacquer & laminated timber, provide a refined backdrop to the striking three dimensional "Matsuri - snapper fish festival" artwork that provides an eye catching backdrop to the counter area. The L shaped servery, with its frameless glass hot & cold displays, allows the full range of food to be easily seen and selected by the busy customer.